We're pleased to announce that ShareLaTeX is now open source, and you can grab the code on Github! 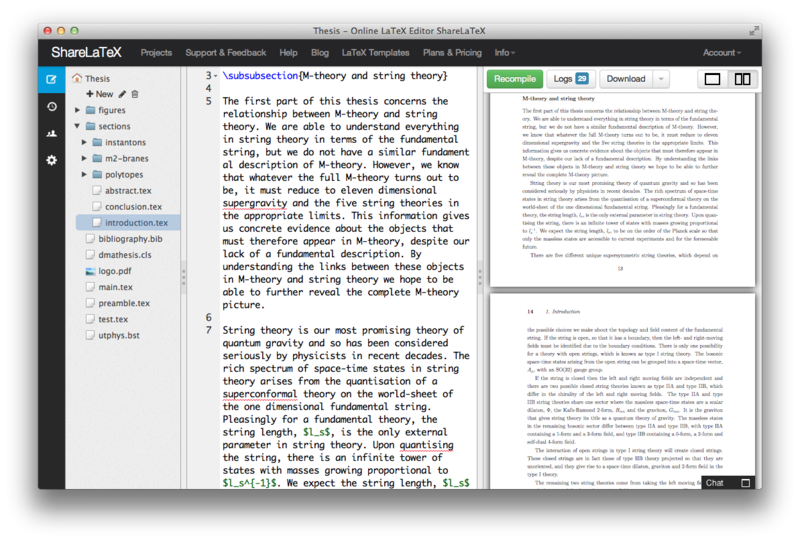 ShareLaTeX is a web-based real-time collaborative LaTeX editor, and you can now run your own local version where you can host, edit, share and compile your LaTeX documents. We're still 100% focused on running the hosted version at https://www.overleaf.com, but we want to be more flexible in how you can use ShareLaTeX, and give something back to our wonderful community. Our main motivation for ShareLaTeX has always been to improve the efficiency of scientists and students around the world. Open sourcing our code base is a natural way to make sure that we can help as many people as possible. As a small team, we're constantly receiving feature requests that we'd love to implement but don't have the time. We've also had a lot of offers from willing volunteers who we've had to turn away because we didn't have a framework for people to contribute. I hope that by open-sourcing ShareLaTeX we can empower our brilliant community to help improve ShareLaTeX in the ways that you want, without having to wait for the two of us to work down our todo list. A lot of people have asked to host ShareLaTeX internally due to company guidelines or data privacy concerns. We don't have the resources to support licensed installs at the moment, but we also hate having to say no. With an open-source version of ShareLaTeX, now anyone who wants to run it locally can. We are still continuing to work on ShareLaTeX full time, and we expect that the time we have to work on new features will only increase in the coming year. (We are starting to look for a front end developer/designer to join our distributed team. If that sounds interesting then please get in touch at support@overleaf.com). If you run into any problems with downloading and setting up ShareLaTeX, please let us know on our issue page. There are also ways to help that aren't all about coding. The whole site could do with the caring touch of a designer, or if you speak a language other than English, then you could help to translate ShareLaTeX. There is LaTeX documentation that needs improving, and we're always keen for bug reports from anyone using the site.